Dascha and Cassie the German Shepherds arrived in March this year, but I haven't had a chance to put any details about them on the site yet. I have at last got a picture of Dascha and their story on this page here - follow the link on the page. Murphy the Great Dane has lived with us for just over a year following being thrown out of his home in Northampton as unwanted. He is a lovely Dog and has been very healthy. A few months ago, however he developed a limp & the vet prescribed pain killers - these seemed to do the trick, but more recently the limp has come back more pronounced. Murphy attended Clarendon House Vets in Chelmsford this week & he had to have a general anesthetic to take X Rays. Unfortunately he has a tumour in his leg which cannot be removed. He is now on much stronger pain killers & is able to walk again, but clearly as an 11 year old Great Dane, he has already lived to a grand age for the breed. We will be devastated if anything happens to him & we are making sure that he has everything he needs and is comfortable. He is still walking about, but spending more time laying down as you would expect from an old dog. If anyone wants to help us toward the cost of Murphy's veterinary treatment, please do let me know - thank you very much. Just a quick thank you to Gary, Rob, Graham & Marie who helped us collect in the remaining hay from below (13th June) and also a further 300 more from another place nearby ! All these bales were FREE to us, as they had at some point been "rained on", But still absolutely fine for us to use. When hay has been rained on, (depending on how much!) it won't store - however as we use 14 a day at the moment, these ones will get used very quickly. There will be more hay to collect soon - well that assumes that the rain actually stops & we get some hay making weather ! Today, on top of the normal daily tasks associated with caring for all the animals at the Sanctuary I had a few extra taskette's to fit in ! - The car was due for a service & as the garage is 6 miles away, I took it there & ran back - however I stopped off on the way back at a place called Mayland Court where they had 250 bales of hay laying on the field - all individual bales - which the owner said we could have as it got rained on & will therefore not store very well. This isn't a problem for us as we use it so quick (12-14 bales a day) that it doesn't get a lot of time to rot! - However with the bales literally spread out evenly in the field, you have to collect them together in piles of at least 10 bales, so when you come back with a vehicle you can stop off at each pile to load the 10 & move onto the next pile - you can't keep stopping & starting a vehicle to load a single bale as this is incredibly time consuming. So midway through my run I stopped to move all the bales into piles of 10 - which is very hard work & took about an hour & 15 - then I ran home the long way making the whole run about 10 miles. Following the afternoon animal jobs I then had to stack 200 bales that Martin & I had already collected from that field (& elsewhere) earlier this week into a big hay stack and get it covered with a tarpaulin - as we have limited indoor storage room & rain was forecast for this evening. When Martin got home we then drove the van back to the field to collect the hay I stacked earlier, bring it back home, unload it & stack it inside one of the stables. We can get about 50 bales in the van & we managed 3 trips this evening (each trip to load, get home & unload is about an hour). Then I had my tea ! There are still 100 to collect & we will try & get that done before Martin goes to work in the morning. We did not have time tonight to undo the Sainsburies food, so that will be have to done in the morning too ! We have a further 400 to collect at the weekend from another place where it is already under cover - we have some help promised which will be nice. 27th May - Fiona on the Radio ! Following winning the Essex Marathon Championships 2 weeks ago, Fiona was invited onto the Steve Scruton show on BBC Essex to talk about her achievements you can hear the interview on the file link below. The interview was 25 minutes with one piece on music chosen by Fiona - for the purposes of this file download the music is edited down to about 1 minute. We have come across a situation where a whole family of lambs and their mothers (23) in all are now facing slaughter as their owner has lost the use of the field they live in. The current owners have advertised the lambs for sale & had a lot of interest from people who want them for the freezer. Their "value" is £50 & so that is what they are looking for. We have been to see the owners today & they are not really that keen to see them slaughtered, but will do so if necessary. They are however happy for the Sanctuary to take them, but of course they still want the income from selling them. Hats off. (many times over)"
As you can see Fiona was very happy to win ! Hopefully someone will pick this story up and give it the attention it deserves - with the media full of Vegan hating Gordon Ramsey who cooked a Horse on his miserable show yesterday. Ramsey is a very keen marathon runner too - yet Fiona, a girl AND a VEGAN is capable of running a marathon 90 minutes quicker than he can - and she has a knee replacement ! - is this a story or is this a story? 12th May - Holiday winners are..
Keith & Philippa Thornton - or rather Taffy & Willow the dogs have won & will be taking their owners to the Peak District later this year - Thanks very much for bidding on the holiday £400 was raised for the animals which is fantastic news. 4th May - Holiday Offer ! Looking for a holiday Cottage in the UK where you can take you Dog ? We have been offered a weeks holiday to tender in aid of the animals at a place called The Old Piggery in Tideswell in the Peak District. In their brochure they say "Some cottage owners tolerate dogs (provided they don’t go upstairs, sit on the furniture, bark, drop a single hair etc etc.). We’re different. At The Old Piggery we truly welcome dogs. They deserve a holiday as much as you, and if they enjoy themselves, then you are more likely to enjoy yourself". Also from their brochure "The Old Piggery - The perfect place for your holiday in the Peak District. This delightful cottage is your well-deserved haven away from the stresses and strains of your busy life. Just imagine: no commuting, no big-city frenzy, no deadlines. Instead, you can take things at a slower pace, enjoy the amazing Peak District landscape that surrounds you. Listen to and watch the wildlife; relax in traditional country pubs, chat to the locals, and enjoy the company of your friends and family". So what do you need to do? - Well if you fancy it for a holiday simply send us an email with your best offer & if your offer exceeds the reserve & is the best one received before 12th May 9:00 pm the holiday is yours. If by this time the reserve has not been met, the holiday will be auctioned at the Dog Rescue Page here. As the holiday is being donated by 2 of our wonderful supporters, all the cash raised for the week will go to the animals here at the Sanctuary - so you can have a great holiday and make a donation to the Sanctuary all in one go !! The Summer Members Open Day will be on Sunday 3rd of June from noon - if you are a member you should have received an e-mail about this already - if this is not the case, please let me know as we may have had a bounce on the e mail address we have for you - or perhaps we don't have your e mail at all ! I am delighted to say that Andi from the Happy Hamsters will be providing the catering ! You can become a member of the Sanctuary by setting up a Standing Order to sponsor one (or all!) of the rescued animals here. There is no set monthly amount, just whatever you are comfortable with & you can be assured that every penny goes towards the animals feed costs, nothing is taken as income, or for admin or any other costs - Please contact me if you would like to help through sponsorship. Major was out on loan, but his 'loan' owner was unable to keep him anymore due to a change of circumstance and his actual owner didn't want him back, so he was facing a grim future. I heard about Major's plight a few weeks back and offered him a place at the Sanctuary as the thought of what could lay ahead for him was preying on my mind. He arrived today at lunchtime, Martin took a days holiday to help and we unloaded Major to a holding area next to William. He seemed to immediately settle down and feel at home with a variety of food items to keep him occupied ! I will post his picture to the Horses page as soon as I get a chance to take some. In the Summer I will integrate him with one of the various horse 'gangs' probably Sonny, Kolyada & Peanut - as they are only a gang of three ! Major takes us back to 27 horses to care for here & if anyone would like to sponsor him or any of the other rescues please do e mail me on the link above - we would be very grateful for your support. Holly is a pony who we took in about 3 years ago - in a pretty sorry state - you can see her original pictures here and read the original rescue story in the news archives here - see entry dated 24th April 2004. During the Winter, Holly lives in the new school area where Dolly used to live, with Skipio, Poppy, Gwilliam & Babushka. Two days ago we found her "cast" - unable to get up in the middle of the school. She had obviously been trying to get up for a while & had grazed her eyebrow (not seriously). From our experiences with Dolly over the past 3 years we now know a lot about getting horses up & so we quickly fetched two ropes with which to roll Holly over herself so she could use her other two legs to help her get up. When a Horse has been lying down for any length of time, the legs against the ground can become numb with the sheer weight & so become less and less able to provide the strength necessary to get the animal up. Rolling them over, whilst dangerous from a getting kicked perspective, enables the animal to use it's two "rested" legs to help them get up. This worked, although once she was up she didn't want to stand still whilst we undid the ropes from her two legs (which was fun as you can imagine). We were not out of the woods though, as she went down again, got up (on her own) & then sat down again. We administered a pain killer and Holly got up on her own - as it was a hot day I decided that she should have a stable for the day where she could get some rest & I could monitor whether she was eating, drinking & going to the loo. Holly was fine by the end of the day and went back out to her friends. It was probably a mild colic which can strike at any time, but are more prevalent at this time of the year. One of the important things to watch for is that the animal is going to the loo - which Holly was - as this is extremely important & demonstrates that the gut is not blocked - as this is usually fatal. I will try & get some updated pictures of Holly this weekend as she is almost unrecognisable from the Horse that arrived here almost exactly 3 years to the day ! As you may have read in the 25th March entry below, supporter Andi has now created his own personal 'running scrapbook' website which you can see at this link here. Andi is running to get fit as well as raise awareness for the work of the Sanctuary. Monty the terrier was one of the first Dogs we rescued back in 1993. He was found running loose on the streets of Harlow with his accomplice Judy. We found him in a bad way on Sunday morning, he was paddling with his paws & making a terrible moaning noise. There was also no reflex in his eyes to movement. Rushing him to the emergency vet at Clarendon House in Chelmsford Martin was told that he had suffered a massive stroke, probably as a result of a brain tumor. He was nearly unconscious as it was and paralyised down one side. We had to let the vet put him to sleep. It was ever so sad, as he never had the chance to say goodbye to Judy. 14 years they have lived together at the Sanctuary & Judy is still doing very well. We believe that Monty was about 3 or 4 when we rescued him, so he was probably about 17/18 years old. We are both a bit too stunned at the moment to feel anything - it was such a bolt from the blue to loose him like that. Monty is the dog featured on the main page (& all the other pages) as the "link picture" to the main dogs page. He was a right little character and will be missed by all who knew him. A few months ago we were asked if we would be able to take some Hens. There were 4500 that needed homes and although we are a bit pushed for space I said we would take 50. There was quite a project going on to find homes for the birds which ran for several months - a lot of hard work was put in by a great number of people and all 4500 found a place. (Sadly I found out later that there were originally 13,500 at the farm, but 9000 had already been killed). The birds all came from a free range unit and had reached the end of their "productive" lives. What most people don't realise that is even farmed "free range" hens don't have much of a life as at a little more than a year old, they go off to slaughter and are replaced with a fresh batch to start the "cycle" again - all because they perhaps don't lay as many eggs. When I think some of the hens here are aged 12+... "Free Range" is hardly the "solution" to the egg problem ! A classical concert was organised by Judith Aslin who lives in Little Melton near Norwich in aid of the Sanctuary. Music teacher Judith's pupils entertained their audience with an evening of recitals. Ellen Morgan (Martins mum) who also lives in Little Melton did a short presentation about the Sanctuary as it was not feasible for either Martin or I to attend. The grand sum of £143.21 to help towards the feed costs of the rescued animals. Thank you to all who played and all who attended in support of the event ! In October 2006, Suzanne Benyon a great young runner and committed vegan tragically died. Suzanne won many track, road and cross country races and competed regularly for Scotland at a wide range of distances and disciplines. Instead of flowers at the funeral, her husband and family asked for donations to be made to the Sanctuary and the £1240 which has been raised is going to be put towards the field shelter appeal. A plaque in memory of Suzanne will be set in place on the shelter later this year. It is great regret that I have to report that we had to say goodbye to Dolly on the 9th March. We have been so upset that we have not been able to write about it here until now. We had had x-rays taken of Dolly's foot at the beginning of March with a view to the Farrier working on her foot. The images are needed to see where her pedal bone is located, to ensure they do not go anywhere near it. Although Dolly was a little bit lame, she was walking very well and surprised us all - including the vet. She had lovely condition, remarkable considering her age and the time of year. The care and attention I have been paying to her to keep her going has been very intense. I have been doing everything I can to vary the winter days - putting different horses in the paddock next to her, youngsters who would keep her zest for life going and old, familiar friends - rugs on and off during the day - she didn't like to wear a rug but I could not afford for her to get the least bit wet or cold. Every time the sun came out for more than a few minutes I ran out and took her rug off so she could scratch and neck with Skipio and Holly. Her diet was so varied and I let her have exactly what she wanted. I gave her the best I could possibly afford. On Thursday the 8th, she started to limp a little bit more. I thought she was just having a bad day but in my heart of hearts I knew she wasn't right - I called the vet. He confirmed my worst fears but Dolly was still keen to carry on and I hoped for a miracle. On Friday, we helped Dolly up after she had been down for the night & she ate her breakfast all up, but it was clear she was not happy standing & she then she sat down in the sun. She was down for a good many hours and when I went out to her to see if she was OK I could see that she had been struggling to get up & could not. She really wanted to get up but just couldn't. She looked, for the first time in her eyes, distressed. I came in and cried and cried. I called Martin and my Mother came over. We all agreed that it was no longer fair to Dolly to continue. There was absolutely nothing more that could be done. She was after all nearly 29 years old, some 8 years older that the life expectancy of a Shire The vet came out and I sat with her head in my lap as he put her to sleep. Believe me, she was at that point, ready to go. It was so peaceful, she just went to sleep. All the others stood with their backs to us at a respectful distance. Then, when the vet left, they all came over and stood over us. Babushka the New Forest Pony who is still wild & whom I have never been able to touch actually came over to me & nuzzled me as I sat curled up crying over Dollys head. She knew what was happening - they all did. I stayed with Dolly's head in my lap until the men from the Crematorium came. I cannot begin to tell you how upset we all were and are continue to be. Skipio is grieving but not like last year when Dolly had to go to the vet - he hated to see her walk away - this time they know what has happened. He is feeling just what we are. As regular readers will know we have been doing everything we can to keep Dolly the Shire well. It is a year ago that she had the terrible fall on the back of the lorry who was bringing her back from the vets after having her corrective shoeing done & that trauma was nearly the end of her (as well as me). But Dolly has a strong will to live & has been doing just that ever since with her best friend Skipio. Although she regularly sits down, she has been getting up unaided with no problems for the fast 3 or 4 months, however this morning I noticed she was down as I was barrowing breakfast down to the horses & she made no attempt to get up. When I reached her I could see that she had been trying to get up & was exhausted. When a horse can no longer get up, it is the end. By chance, Martin was off work today, but the two of us were unable to pull her up. I wanted to try to see if she would get up, as although she did look 'tired' she voraciously ate all the apples I had taken her & clearly this was a sign that she hadn't quite given up yet. I phoned Tony & Ben Skeggs the Hay merchants & they were on their yard, but dropped everything to drive over & arrived within 5 minutes. Together we managed to turn Dolly over onto her other side, but she was still too exhausted to get up. Having almost given up, we tried one more time & she got up. She then ate her bucket & haylage & started to neck with Holly - another friend. I am very grateful to Ben & Tony for coming over so quickly. We syringed two sachets of Finadine down her throat (very strong pain killer) and made sure she had buckets of water near her, to save her having to walk to the trough. Fortunately today was sunny & she really enjoys having the sun on her back. This evening she has had two more sachets of pain killer & I don't think I will get much sleep tonight in fear of what tomorrow will bring. I know we have been living on borrowed time with Dolly, at nearly 30 she is 8 years older than you would expect a Shire horse to reach. Clearly it goes without saying that if the time comes to say goodbye I will have to make that decision, but she is so desperate to live, you can see it in her eyes. I had a 10 mile run to tackle this afternoon & clearly with my mind in turmoil it was with disgust that I rounded a corner to see 'the hunt' all over the road. I removed my fluorescent circa as I know the bright colours can startle the horses, as usual this action was not acknowledged. Some builders I ran past were shouting at the hunt as they were using terriers to dig out a fox - now was it my imagination or did the government ban hunting foxes with hounds? - no, it must of been my imagination. I had to run past & one huntsman who was in the road with the hired heavies the hunt always have in tow started to shout at me, saying - oh look, something I can chase, shall I chase her down the road?" They were all laughing so I stopped, turned & said "well come on then?" There was no response. I carried on saying "I suppose you will get off your horse to -chase me as that would be only fair - or don't you 'do' fair?" Again there was no reply so I carried on. Six years ago today the Hunt trespassed Tower Hill Stables Animal Sanctuary, Killing Bobby -the Shire Horse by scaring him to death with their hounds all jumping round him - he died of a heart attack in front of me as the huntsmen & women & their followers jeered & laughed at me. Fearful of where the Hunt were heading, I stopped running again & asked a car driver who was clearly a 'hunt follower' whether they were heading towards Asheldham. He wound down his window & shouted extremely rudely "WHAT HAS IT GOT TO DO WITH YOU? I clocked the half drunk bottle of Grouse whiskey on the passenger seat beside him & I looked at the 'creature' occupying the driving seat of the car. The smell of alcohol that hit me after the window came down was frankly shocking & I looked at his face - or at least where one would normally expect to see a face, and took in the wisened features. The jaundiced yellow of what should have been the whites of it's eyes was only possibly matched in hue by the yellow streak running down his back. I said "Actually it has got quite a lot to do with me". I explained that I lived in Asheldham & ran a Sanctuary & that 6 years ago his "lot" had trespassed the Sanctuary killing a horse & so if they were headed that way I would like to know so I can get off home. Following a short silence as his no doubt whiskey fuddled brain struggled to engage, I said " I asked you a civil question & it is clear that you are incapable of giving me a civil answer so I'll ask the Police"
I ran home & on the way flagged down the community police mobile explaining to the two female officers that a) there was illegal hunting going on b) there was drink driving going on c) The hunt were being abusive to members of the public. What chance would two female officers have against the mob? I'll tell you what - None at all. We have found a new shop to sell Tower Hill Stables specific merchandise ! So far we have only created a small number of designs. The items all have a "base" cost & we have added a small % to this to get the selling price. If anyone orders any of the items, you pay through their website & then they send the commission percentage through to the Sanctuary. The items are priced in Euros as it is a German company. They are not dirt cheap either, but are very good quality. Please don't forget you can still sponsor Divina for her fun run (see below) ! The field shelter donations are now at £315, still £1700 to go !! - it's a tall order I know - particularly on top of the monthly £4000 we need to feed everyone. The weather continues to be a real difficulty for me to deal with on a daily basis & to help things along, Major has again decided to smash his stable door by leaning on it so hard that the bolt has been forced "through" the wooden telegraph pole it normally is fastened into, cutting a neat sideways slice horizontally ! - ideal - means of course that the whole bolt arrangement has had to be moved & a new bore hole drilled higher up the pole - still I had a spare 5 minutes & was wondering how to fill it ! We have fixed it of course & also put in a new "bar" above the whole door, fixed with metal mounts that "should" prevent Major from getting his shoulder the door ! The problem is that as soon as I open up the main stables each morning, the horses that are in stables get very excited as they know it's breakfast time & that means Dobson & Horell 16 plus shortfeed (which smells so nice I have been tempted to try it! ), Carrots & Haylage and after breakfast they go outside to play. The normal size horses an get as excited as they like without breaking anything, but Major the Shire is just so strong that when he leans on the door - well, you can see everything bending ! Dolly the Shire is having her foot X-Rayed tomorrow so that the Blacksmith can come in and renew the orthopedic shoe. They need an X-Ray to see where Dolly's Pedal bone is positioned before they start cutting and clipping the foot. Unfortunately, the master Blacksmith who had done all the previous work on Dolly's foot appears to have disappeared ! - We understand he was secretly selling up & has emigrated to Oz. - Not even his Blacksmith lads knew, nor the veterinary practice he was assigned to ! A big thank you goes to Divina Grove and her mum who have decided to do the Brentwood 5K Fun run on 25th March to raise funds for the Sanctuary ! If you would like to sponsor Divina and/or her mum, please contact me by e mail and I will put you in touch. It appears that Winter is here now & the older animals are all rugged up - Dolly the Shire has two blankets on & even Major and Angel are rugged. The freezing conditions make life much harder - all the water freezes up meaning that I have to carry buckets from the house - which for 27 horses is not that perfect. Both Martin & I have had Flu recently so this has made it even harder. If you are reading this and are not a member of the Sanctuary, please do consider joining to help with the feeding costs. You can join from as little as £2 per month and every penny goes to the animals feed costs - none goes in admin or salaries etc. We are really struggling to go on as the costs rise. [update by Martin] So we set off last Saturday night in the large Van we have been kindly loaned by Supporter Keith from Brentwood to fetch 50 bales of hay as we were running low. It was dark & freezing & at the end of a long day this isn't an ideal job to be doing. We pulled out the drive and were turning round outside Percy Pigs field (for those that know the lay of the land) when.. splutter, splutter, splutter and Van stops right on the junction. So we call the AA, and wait in the freezing cold with torches waving the cars around the stranded vehicle which was, being right on the junction, a real concern. The AA arrived after about 40 minutes & the Man started to conduct some tests. After firstly telling us both off for not having the exact model of the van available when we made the initial call "It makes a real difference to us to know the model before we come out" he repeated at least 17 times. Eventually he started to become frustrated that he was unable to work out what was wrong & out of the blue suddenly pronounced that the reason it won't work is because you have put petrol in it ! The Van is a diesel... All eyes turned to me (including those of the Pigs who were listening with interest) & it was like one of those TV shots where they zoom the centre of the picture out - at a sudden moment of "realisation". The AA man was now getting cocky & said "Oh we deal with this sort of thing every day. This is what we call a self inflicted incident", he repeated a further 17 times "There's nothing we can do other than tow you to an emergency garage or tow you home". He proceeded then to get some fuel out of the system somewhere under the bonnet & took great pleasure in showing me his plastic glove now covered with fuel which he sniffed (note the spinal tap reference) and pronounced as being petrol. I was now in a state of shock - How could I have been so stupid? This isn't our van - What am I going to tell Keith?? "Oh yes", he went on, reminding me again that this was a self inflicted thing & that it would cost us £200 to have the tank drained & did we want him to tow us to the emergency garage now? I opted for the towing home option & after he mentioned for the 15th time that the AA would never come out to this vehicle again, he left us. I came in & called Keith - not before I had googled "Petrol in a Diesel" & was dismayed to read that apparently 400 people a day do this in the UK & it costs up to £7000 to repair as diesel apparently destroys petrol engines... Keith was cool about it, not believing that I had really done it, and said he would get the RAC over in the morning for a 2nd opinion. I was absolutely sure I hadn't put petrol in it, but when you have an "expert" telling you that's what you have done, the old self doubt starts to creep in & consume you. I slept well that night (not) & by the morning not even the Cats were talking to me. The RAC came (with Keith) & spent a few minutes with the Van. I was just booking a one way ticket to Finland when he announced that the problem was with the "injectors" and nothing to do with the fuel ! Can you believe that? - What a relief !!! (well for us at least...) The van was towed to a garage & is being repaired. I am writing a stiff letter to the AA. Every time I fill up any of the vehicles now I am checking 27 times its the right fuel... I will be claiming £50m from the AA for mental anguish - although I think we will be lucky to get £50 ! 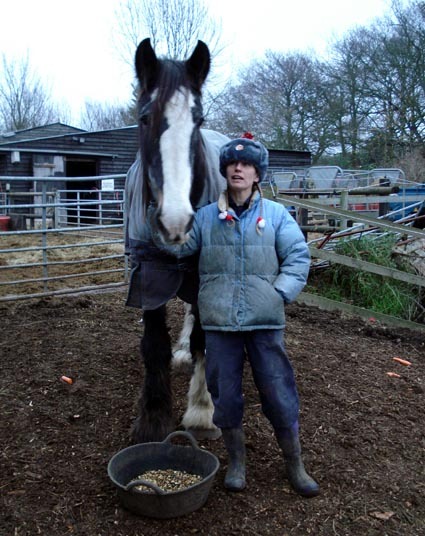 Kolyada is one of the Horses that came over from Siberia - see here - and who currently lives with Bunny babe & Peanut. During the day they are turned out onto an area of hard standing to exercise - in the Summer they live in the fields of course. Anyway yesterday I was seeing to the dogs when I heard a crash - this is not uncommon as the horses can make a racket by kicking at the gates with their hooves or by re-arranging the hay troughs in the main school area ! - However with horror I realised that Kolyada had decided to have a roll (not uncommon), but she had decided to start her roll right next to the gate to her turnout area and had rolled into the gate resulting in three of her 4 legs being stuck through the bars of the gate. She was panicking badly, and I dropped everything to rush over to her, Clearly a horse thrashing about with it's legs stuck is a dangerous thing, but with her legs where they were, she could easily have a break & that would likely mean curtains. Typically, the gate concerned is brand new - only fitted on Sunday - a new extra strong (& heavy one) the old one had been recently adjusted (wrecked) by the Shires. I had to try & lift it off it's hinges whilst easing it back to free her legs. It must weigh over 100 pounds & was secured tightly at the hinge side. Frantically I had to find a suitable spanner & managed to get it off & withdrawn from her legs without delay. Kolyada got up & was OK, although a little shaken. She is now scared to go near the gate - which is probably a good thing. Happily this kind of thing is unusual, but demonstrates that with large animals like this, things can "happen" at anytime of the day or night - which is why it is essential that we maintain a 24/7 oversight of the animals. Some good news, the Shelter Appeal received a £50 boost today, taking the appeal fund to £65 of the £2000 target. If you can help with this, whatever amount you can spare, we would be very grateful to hear from you. I was just feeding the Pigs across the road where Percy Pig lives when I suddenly head Horses galloping. All the Sanctuary Horses live on the otherside of the road, so my immediate panic was 'oh, no they have escaped!' But they hadn't - No, it was 5 "other" horses loose in the farmers field next to Percy's field which isn't fenced. They were all galloping like mad things & heading for the road. I ran up to the gate, but by the time I got there they had hit the road & were galloping up it towards Latchingdon. I then told them that we needed some feed & we should try & herd them towards the property, but the two men pooh poohed my suggestion (well I'm only a girl aren't I?) & wanted to do something else. So I decided to let them get on with it & went home. About half an hour later the Fire Brigade called me to ask if I would help them get the Horses & they picked me up in the pump (Fire Engine) at the drive entrance (together with my bag of feed!) and we went off to locate the horses. We found them up the road & using the feed we managed to coax them into a local farmers (well fenced) field where they were penned ! Max is a Welsh Cob who I rescued many years ago and he is now 30 years old. A few years back we nearly lost him to colic and it was only thanks to the fantastic work of the vet (Ceci Knutzen) that he was saved. Colic is bad news for horses in particular as their digestive system is actually quite poorly designed as whilst some parts are wide, the tract can narrow to a very tiny tube through which all the food they eat must pass. A Horse cannot be sick, so anything that gets to it's stomach has only one way to go & so if a blockage occurs it means Colic - which will either sort itself out, or if not it will cause death. Operations can be performed, but the success rate is not high. On Sunday Max, who lives with 3 of the Cows, was not his usual self and was not eating - this is a bad sign as he is usually very greedy! I decided to keep an eye on him, as most colics are generally mild - like a stomach ache for you or I - and pass in a short time. However by Tuesday, he was no better and had been lying down on both sides - another sign of colic - in a horse that rarely lays down. I brought him into a stable to let him rest on a soft bed of straw. Max usually hates being in a stable & sometimes when they are put in a situation they don't like - like this - or being loaded onto a horse box - it can literally make them go to the toilet ! - which is what you want to achieve with a colic as it shows that things are "moving through" the system. A few hours later and he was starting to look a little better in his eye - I find you can tell a lot about an animal from their eye. He had gone to the toilet a little and was starting to show an interest in his hay. We have had a mobile field shelter put in the main school where Bo the Horse and his gang live during the Winter. Bo lives with 7 of the younger horses who are all capable of living outside in the Winter - BUT, we wanted them to at least have somewhere to get out of the wind and rain if they want to. These mobile shelters are specifically designed not to have any foundations and are built on sledge like runners so they can be towed to different positions if necessary. Being 'mobile' means that they additionally do not need to have planning permission which of course cuts down time and expense. The shelter has cost just over £2000 including VAT and the cost of putting it together (a days labour for 3) and this is of course a huge expense for the Sanctuary. Hettie is a little elderly dog who arrived at the Sanctuary a few months ago. She is very sweet but is loosing her eyesight. Awful to think that she was on death row at a dog pound at her time of life - but she is just one of 1000's. She will feature on the dogs page soon ! Hettie is a very curious little dog which is why we extended her name to Hettie Wainthrope (assuming you are familiar with the character !). Anyway, Hettie's investigation nearly cost her dearly early this week ! Anyway, on Tuesday night after we had gone to bed - Charley one of the other dogs would not settle - he was very restless - after a while we got a feeling that something was wrong, so got up to check the house. The dog roll call revealed that Hettie was missing ! She normally sleeps in a particular armchair in the lounge but there was no sign of her. After a thorough search we got our coats on & went outside with torches. It was now about midnight, but there was no sign of Hettie. The Dogs are prevented from wandering down to the fields by sheep hurdles which line the back patio - however close inspection revealed that one hurdle had been pushed & there was a small gap - a gap big enough for Hettie to investigate her way through. We went down to the fields & past the chicken areas & searched everywhere for about 20 minutes - nothing. We were getting to the "point of panic" when Martin went to check another field & there in the distance in the torch beam he thought he saw a black & white cat - but it looked a little big for a cat & wasn't moving. The field was quite muddy and on advancing towards the shape he soon saw that it was Hettie who was sitting quite still - clearly lost. She was quickly scooped up & taken back to the house where we dried her with towels & a hair dryer. She was clearly a little upset and we decided that the best place for her to warm up was in bed under the duvet ! She finally settled down at about 3 am - another good nights sleep all round ! The next morning she was 100% again BUT has moved into Sam's room (Sam is Blind) and is living with him until we can sort out the gap in the fencing this weekend. Hopefully her future investigations will be less dramatic !